Pavlovsk was built for Russian Tsar Paul I, only son of Catherine the Great. The palace is located southeast of the city of St. Petersburg, a few miles beyond the town of Tsarskoe Selo. The original estate was around 1500 acres and was a gift from Catherine to Paul on the birth of his first son, the future Tsar Alexander I, in 1777. Work on the palace began in 1781 under the direction of the famous Scottish architect, Charles Cameron. Being one of Catherine's favorite architects did not enamour him with Paul and his wife Maria. Paul detested his mother and had a habitual aversion to her favorites. After Cameron's departure, many other architects worked at Pavlovsk, including Voronikhin, Brenna, Rossi and others. Pavlovsk has a dual look and feel, which reflects the different outlook and tastes of its oweners, Paul and Maria. Pauls hand can be seen in prominent militaristic motifs throughout many of the state rooms, while elsewhere one can see the exquisite and refined tastes of his wife at work. 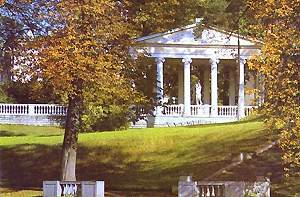 After the murder of Paul in 1801, Pavlovsk became the primary residence of his widow. After her death in 1828 the palace passed to their son, Grand Duke Mikhail Petrovich. Mikhail was childless and bequeathed Pavlovsk to his nephew Konstantin Nickolaevich, who left in turn to his son, the famous poet Konstanin Konstantinovich. During this period the main building of the palace was recognised by the Romanov family as a unique artistic and historic legacy and was preserved as a virtual museum. Very few changes were made to the decoration and it continued to have the look and feel of the early 19th century. After the revolution the palace passed through difficult times involving many threats to its very survival. During WWII the palace was badly damaged and looted. It was restored after the war and is now open as a museum. For the best history of the building look for "Pavlovsk, Life of a Russian Palace" by Suzanne Massie. The design of the central block of Pavlovsk, with its austere lines and low dome, is the work of Charles Cameron. The architect employs the use of fine, crisply carved Corinthian capitals and frieze to soften the square central block of the palace. These motifs and the use of a rather delicate collonade around the dome are Hellenistic and Roman in in spiration. Catherine the Great was greatly impressed by Cameron's bravura application of these styles and she used his services often, especially in her own private quarters at Tsarskoe Selo. One of the most impressive halls of Pavlovsk is Cameron's Grecian Hall. Green fluted columns of artificial Verde Antico marble line all sides of the room. A band of artificial golden-brown Sienna marble accents the lower part of the rear walls. Niches contain copies of ancient sculptures and a series of urns and vases made of semi-precious stones stand on fireplaces and tables encrusted with lapis and ural jaspers. The furniture was designed by Voronikhin. The current set are all copies except for a single chair saved during WWII. Hall of war, designed by Brenna and later modified by Voronikhin after a fire in 1803, is a pair to the Hall of Peace on the opposite side of the palace. The niche contains a tall ceramic stove decorated with carved plaster. On top of the stove stands a Roman eagle in a laurel wreath. On either side of the niche stand Roman trophies of war. This hall has enormous plate class windows, which look out over the palace park. The Lilac Salon occupies the former bedroom of Paul I. It was designed by Carlo Rossi and is decorated with massive panels of artifical marble mottled with waves of lilac. The panels are framed by panels of gilt neo-classical design. A unique set of furniture in the Russian Empire style was designed by Rossi and executed in rich, smoky birch with gilt carvings. Here one can also see a beautiful gilt-bronze table set with glass which was modelled on examples found at Pompeii. To the left, a tall urn turned in gray Ural Jasper stands in front of one of the room's large windows drapped in yellow silk. The circular, two story Italian Hall is located at the center of the palace and is lit by the central cupola of the palace. Highly polished artificial marble porphry panels are set with gilt-bronze sconces. The central chandelier is decorated with delicate crystal feathers. Quarenghi designed the magnificent doors to the hall which are made of mahogany and rosewood set with gilt bronze. Ancient Roman and Greek scultures stand a in series of arches niches around the first level of the hall. Above, a second story arcade with a bold balustrade surrounds the hall. 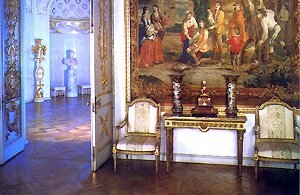 Drawing room is noted for its splendid Gobelins tapestries which were a gift to Paul and Maria from King Louis XV of France during their visit to his kingdom. They date from 1780 and show imaginary scenes of the West Indies. Paul and Maria travelled broad under the names of the "Count and Countess of the North". Naturally, everyone knew who they were and they were showered with expensive gifts from the crowned heads of Europe. Many of these made their way to Pavlovsk, which was then under construction. In front of a white marble fireplace in the Small cabinet stands one of the most historically significant items of Pavlovsk. This firescreen is made of rare hard woods with columns made of turned elephant ivory. A delicate painting a mother embracing a child is set in a circular frame. What makes this piece of furniture stand out is the place it played in Russian history. It originally stood in Paul's bedroom at the Mikhail Castle in St. Petersburg.